Grande Prairie First Aid is a St Mark James training affiliate located in Grande Prairie, Alberta. Quality training programs are taught by workplace approved certified instructors in high end training facilities. Students can browse the Grande Prairie First Aid website for a list of available classes and rates, as well as a complete list of schedules. Prospective students can use the registration form on the website to sign up for a class. Other ways to enrol include e-mails, telephone calls, and walk-ins during business hours in any of the training centers. Grande Prairie First Aid has the most affordable class rates in Alberta. The fees are paid in full during enrolment so students don’t have to worry about expenses while training. Fees are inclusive of everything – taxes, certificates, and workplace approved training manuals. Students who drop out and are unable to complete a program are entitled to a full refund of the class fees, as long as a 72-hour notice is given. 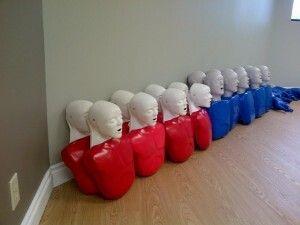 Standard first aid and CPR training programs are 16 hours long. Students are taught how to recognize and react to emergency situations and injuries. Topics such as emergency medical services (EMS), wound care, cardiopulmonary resuscitation (CPR), and automated external defibrillation (AED) are included in the class curriculum. AEDs are machines that are attached to the chest with pads and apply needed shock to the heart. Stand-alone CPR/AED classes are also available in three different levels (A, C, and HCP), lasting 4, 5, and 6 hours long respectively. Certificate cards are awarded to all students who are able to complete a training program. Wall-mount certificates are available upon request. The certificates are only valid for three years but can be renewed, if still current, through recertification programs. Recertification for first aid training is 8 hours long, inclusive of CPR level C recertification. Recertification classes are held twice a week. Students who want to train at home or want to hire a trainer for a special event like a conference, can book private instructors are Grande Prairie First Aid. They are certified by St Mark James and have hourly rates. You can inquire about booking them through e-mail or telephone call. Do not read. Focus on the horizon or a stationary and distant object instead. Rest your head on the head rest. Do not sit next or near to smokers. Avoid spicy and greasy food before riding a vehicle. Do not overeat as well. Take antihistamine 30 to 60 minutes before the trip (expect drowsiness). You may take scopolamine if it is prescribed to you. Eat dry crackers or ginger ale to settle your stomach if you experience nausea.